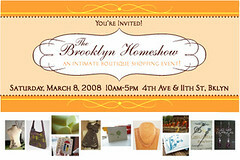 A few of my fellow members from The NewNew Etsy Street Team will be participating in the Brooklyn Homeshow. The Brooklyn Homeshow is an artisanal homeshow organized by a group of independent designers from the New York area to bring you a diverse collection of handmade goods. If you are in the New York area heck them out! cool, can't wait to see you there!